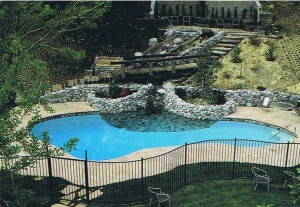 Skinner Pools was established in 1948 by Max Skinner and has been family owned and operated for over 62 years. In 1981 his sons, Bryan and Vance took over the company and have continued serving the Southern California area, from Los Angeles to Solvang. We specialize in Replaster, Custom Remodels, Exposed Pebble, Hydrazzo and Color Pools. We did the first Color Plaster Pool in 1956! We are the leader in our industry when it comes to the replastering method. Our pools are prepared by 36,000 PSI water blast machine, avoiding the risk of structural cracks and rusting associated with the old pneumatic jack hammering method. And we offer the longest guarantee in the industry, 15 Years on plastering and 25 Years on our Exposed Pebble Surface!! In 1982, was added entire pool remodeling to our list of skills, including tile, masonry and plumbing. All phases are run in house with a foreman on each crew. Our early morning meetings keep the lines of communication between the owners and office open. The foremen are also in constant communication with our office via Nextel.